Why are there different three "Payback Amounts"? MCA Suite takes a three (3) step approach to track cash advance deals. As a result the payback amount (sometimes referred to as the RTR or Right to Receive) may be different during each stage of the merchant cash advance process. 1. Payback Amount (in the Original Deals section) -- This amount is calculated based on the Advanced Amount multiply by the Factor. The information is based on the original offer, when the deal is still in negotiation between the Funder and the Merchant. This is most likely to appear on the cash advance contract. 2. 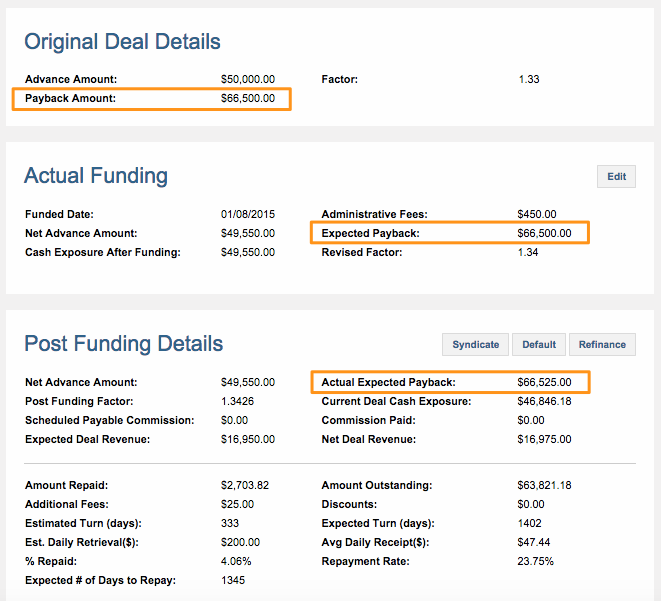 Expected Payback Amount (in the Actual Funding section) -- This amount is calculated when the deal is funded by the Funder. This amount could change at the time / date of funding. 3. Actual Expected Payback Amount (in the Post Funding section) -- This amount is calculated during the post funding stage of the deal. While the Merchant is repaying the Funder, the Funder may apply fees or discounts to the payback amount based on various reasons. For example, the Funder can charge the Merchant a fee for bounced checks or late payments. The Funder can also give the Merchant a discount on early payment or refinance.